After my last post we went for a last walk in Lihue. 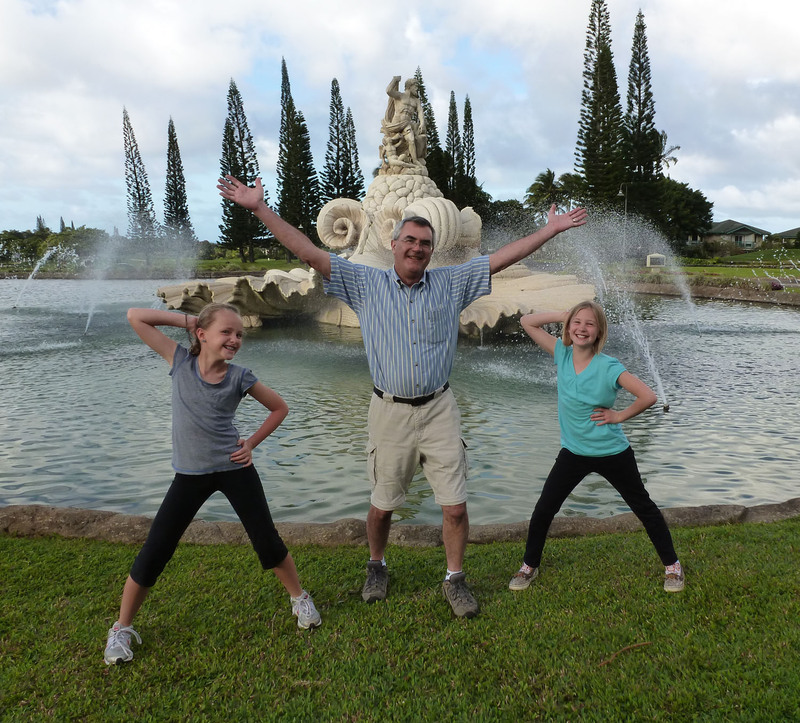 I got this great photo of Steve and the girls by the fountain. On the walk back to the condo it rained on us – so typical of Kauai! Luckily we dried out before heading to the airport. I use the Flight Tracker app and was notified as we were eating dinner that our flight out was going to be delayed by an hour. We knew we would miss our flight from LAX to Dallas before we even left the condo. I spent an hour on the phone with Angela at American Airlines. There were very few options. Monday morning Steve and Lola leave early early and fly to Phoenix, then on to Dallas, and then Lola goes on to Baltimore. Elanor and I leave a bit later and fly through San Francisco to Dallas, arriving just a bit after Lola will have taken off for Baltimore. If all goes well, we'll be home tomorrow. There are thurnderstorms predicited for Dallas tomorrow – I hope they don't materialize. There were a lot of people on our flight who missed connections. Some were luckier than us and managed to get out on Sunday. Others were less lucky. We at least had a plan and found a hotel so did not spend any time hanging around hopelessly at the airport. Instead we're hanging out at a Comfort Suites that was nice enough to let us check in really early. The girls are watching the Discovery Channel. The shark shows were good. I'm not loving Doomsday Bunkers – but the girls think it's full of good tips. As it turns out we're too tired to go out and about. Lola has had a nap. I had to wake her up so she didn't sleep the day away. I admit to being tempted to nap myself but we all have to readjust to the time. In some ways this little stop is easing us back into our own time zones. Our flights are early tomorrow, there just didn't seem to be a good reason to rent a car today. So, here we are. Perhaps tomorrow we'll be home!